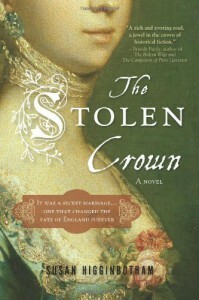 In choosing to write from the alternating perspectives of the Duke and Duchess of Buckingham, Kate Woodville and Harry Stafford, Higginbotham is able to bring a “personal” view to historical events during the reigns of Edward IV through Richard III. Additionally, seeing through Kate’s eyes gives a more humanizing look at the Woodville family than any book of the period I’d previously read. Although a work of fiction, Higginbotham brings an interesting interpretation to the motivations of the major players during this tumultuous time. I appreciated her note at the end of the book detailing what was based on historical evidence versus what were elaboration/fabrication, as well as an explanation of how she came up with her portrayal of the various players. This is the first book I’ve read by the author. I’ll certainly be reading others.